How much does it cost to travel to Marrakech? How much money will you need in Marrakech? MAD550 ($57) is the average daily price for traveling in Marrakech. The average price of food for one day is MAD101 ($10). The average price of a hotel for a couple is MAD744 ($77). Additional pricing is in the table below. These average travel prices have been collected from other travelers to help you plan your own travel budget. How much money do I need for Marrakech? 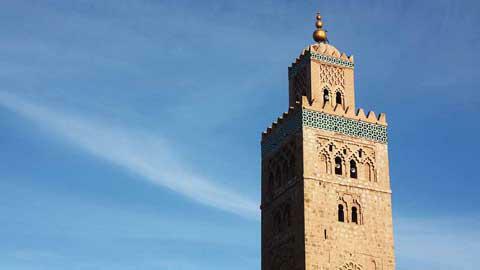 Marrakech is on of the most popular travel destinations in Morocco. It is the third largest city in Morocco after Casablanca and Rabat and is located near the foothills of the Atlas Mountains only a few hours from the Sahara Desert. It's a beautiful city that is often referred to as the "Pink City" because of the pale pink color of many of the city's buildings. These striking colors make the city particularly beautiful during the evening hours when the low sun creates a very dramatic lighting. Marrakech's climate is hot and semi-arid. The winters are damp with mild temperatures and the summers are hot and dry. In the winter, temperatures hover around 55 degrees Fahrenheit and in the summer they can climb well about 100 degrees Fahrenheit. Although temperatures are somewhat comparable to a Mediterranean climate, the city receives far less rain. Djemaa El-Fna is the large city square in Marrakesh and it is a center for dining, entertainment, and activity. In particular, it is highly recommended in the evening hours when it is filled with musicians and performers. There are many food stands that open up in the evening and dining at these booths is part of the atmosphere. You should definitely spend at least one evening eating and exploring Djemaa El-Fna. Beside Djemaa El-Fna is Koutoubia Mosque, another famous spot in Marrakech. Also be sure and visit the tanneries where you can see leather being dyed in a variety of colors. There's a distinctive smell to the area, but it's a fascinating sight, and a great place to purchase some leather goods if you're in the market for them. Other sights in Marrakesh include Palmeraie, the Saadian Tombs, the Majorelle Gardens, Dar Si Said Museum, Ben Youssef Madrassa, El Bahia Palace, and the Menara Gardens. Marrakech is split into the Medina (old town) area and the Gueliz or Ville Nouvelle (new town). The historical old town is filled with meandering alleyways, shops, restaurants, and historic homes. It offers the unique character so many people seek out in Morocco. The shops often sell odds and ends that appeal more to the tourists than the locals, but it's fun to wander through and browse. It's also a great place to try your hand at bartering, but remember to cut the price down dramatically, usually to less than half the original asking price. The new town is far more modern with upscale restaurants, modern hotels, and chain hotels and restaurants. It has a completely different atmosphere and you can easily find western restaurants if you find yourself having cravings from home. There are also many expats that live throughout the new town and its easy to see how this population has dramatically changed the feel of the area. A visit to Marrakech is not complete without wandering extensively through the city's medina and shopping at the souqs. Another popular activity is to visit a hammam and stay in a riad. Riads are Moroccan houses with internal courtyards and extensive Moroccan decorations. Morocco is known for its food and Marrakech will not disappoint. Every night Djemaa El-Fna comes to life with street stalls and large white tents where you can grab local dishes or snacks. The menus are similar at most huts and you'll find tajine, couscous, brochette and soups. Other local specialties include offal, egg sandwiches, and interesting local tajines. If you're looking for a more upscale dining experience, you'll find the best options in Ville Nouvelle. One option in the medina is Diaffa, which is an upscale restaurant in one of the city's oldest buildings. The atmosphere and cuisine is not to be missed. It's easy to walk around the medina, though you'll likely get lost at least once. Exploring the narrow alleys is a large part of the appeal in Marrakech though, so allow yourself plenty of time to simply walk. Outside of the medina there are a variety of transportation options. Most of the bus routes stop at Djemaa El-Fna and Place Youssef Ben Tachfine. There are also open-topped City Sightseeing buses that take you around town and offer city information via headphones. Taxis are available in abundance but make sure you negotiate hard and understand the price of the trip ahead of time. It also helps to have exact change as many drivers will claim that they cannot make change. Another unique option is to take a caleche, which is a small horse-drawn carriage. You can find them at Square de Foucauld and make sure you negotiate the price in advance. This can be a fun way to tour the city. Cheap hotels in Marrakech are everywhere, but you won't be able to find them before you arrive online or with a travel agent. Wait until you arrive and then make your way to the main public square in the middle of town. Once you arrive, head down some of the smaller alleyways that lead off of the main square, and you will see various signs pointing to small riad style hotels. Many of these hotels are just as clean and nice as some of the more expensive counterparts, but may be lacking in amenities which makes them much cheaper. You can always negotiate from the price that they quote you.